What is birth celebration? It is a blessing. As we celebrate many life transitions, the celebration of birth is a tradition that spans many cultures and goes back many hundreds of years. Māori would perform the Tūā and Tohi rituals where a baby was named and the tāngaengae (cord) was severed as the tapu (or sacred forbidden) was removed from the baby, they were then blessed with water in a stream or waterway of significance. Ancient Greeks used to celebrate the arrival of a baby by shouting loudly, and after the cord was cut, mother and baby would be bathed together. Later on the father would walk 7 times around the hearth carrying baby to welcome them to the family. This was called Amphidromia or Running Round. Ancient Tibetans would dress their baby in new clothes and take them to temple for blessing after using soot from the bottom of their pot to blacken baby’s nose, this was to trick evil spirits. In Egypt the mother blessing was shrouded in mystery and was very much ‘women’s business’, after birthing, women were secluded with their babies for a period of time before they resumed normal day to day life. One major change that has occurred through the ages is that many of these rituals are now performed before birth instead of after the birth of baby, and these ceremonies are designed to honour the woman in her pregnant state. These rituals perform many functions, they induct women into the circle of motherhood and prepare her emotionally and spiritually for the arrival of her child. They allow the community to share in the moment and gather in support around the mother. They givesus a space to share wisdom and stories that will help new parents navigate this journey. The modern interpretation of a birth ceremony, in our industrialised world, has become the baby shower. While a baby shower can meet the material needs of new parents it often misses the more spiritual and emotional elements. An alternative to a baby shower is the mother blessing, which is a ritual that honours the birthing mother and prepares her spiritually for her journey. Mother Blessings originate from Blessingways which are Diné (Navajo) in origin and are a celebration of creation, harmony and peace. Their original form and purpose was to bless using song and can sometimes be referred to as the ‘singing over’. It is important not to replicate this important cultural practice in a non Diné context. A non appropriative alternative is a Mother Blessing. Blessings are performed for a number of life situations but in more modern times their intent has been lent primarily to honouring the pregnant mother and celebrating her impending birth. Mother Blessings for pregnancy and birth are primarily a woman guided ritual and are performed to celebrate the creation of new life and restore emotional and spiritual balance in the woman. A circle of wise women prepare a mother and ease her fears, preparing her for birth. Birth and the entry into motherhood is an intense and permanent life change. Birth is one of life’s most significant transitions. Healing “recovery from loss,” special tributes, recovering from fears or scars from previous births or our culture of fear surrounding birth, releasing fears is a potent element of the ritual. By honouring a pregnant woman through ceremony, we are affirming that pregnancy, birth, and motherhood are valuable and meaningful rites of passage deserving of celebration and acknowledgement. Celebrating “the expressing of deep joy and the honoring of life with festivity.” Celebrating the very nature of her pregnancy and her impending birth and arrival of a new person. Birth is a time for joy. A Mother Blessing creates an intimate circle of support that will cradle her as she prepares to give birth to her child and meet her spiritual needs in this time of transition. Surrounded by a circle of wise women and friends, a mother to be can gain a sense of power and confidence that will help her rise to motherhood. A Mother Blessing is also about a community claiming a child into their heart and acknowledging their arrival. Washing of feet – washing a mothers feed in warm water and scented oils will relax her. It is an act of service to the new mother acknowledging her contribution. Using henna to paint hands, belly and feet to honour the baby within. Massage – gentle shoulder or foot massage to relax the mother. Smudge sticks – dried sage, rose petals and other herbs burnt and used to ‘cleanse’ the birth space. Prayer flags – hung in the birthing space with written words of love and support. Affirmations – the mother is given affirmations written or verbal to help with her birth journey. Letting go of fears – the mother speaks her fears or writes them down and they are ‘blown away in a bubble’ or floated down stream. Feeding the mother – bringing the mother her most desired food, filling her freezer. Guided meditation – to help a mother release her fears and welcome her baby. Circle of beads – each one a thought of love or kindness from a friend. Brushing and braiding of hair – pampering the mother to relax her. The hair can then be unbraided at the onset of labour. Belly cast – a memento of her magical state. Sister circle – a symbol of connectedness, a band around the wrist or shared token. Lighting a candle – lighting a candle at the mother blessing and again at the birth. Making an ipu whenua – a vessel to bury the whenua in. Making muka – extracting muka fibres from flax to tie the pito (umbilicus). Gifting for an altar – each woman gifts the mother a small item for her birth altar. Moon based ritual – any ritual relating to the moon. A full moon circle. You may choose to do all of these, or none. Each ritual is as individual as the person. One of the decisions homebirth families will have to make is how they will treat the placenta. Throughout history the placenta has been treated with varying degrees of respect and ceremony. Current medical practice is to dispose of the placenta with other medical waste. However, many home birth families take a more respectful approach. The placenta is the organ that nourishes and protects your baby in the uterus and is considered sacred by many. Until recently in New Zealand history there was no accommodation made for more ritualistic or traditional placenta treatments. However it is now acknowledged that the placenta is considered precious by many, and is to be respected. Traditional Māori practice is to bury the placenta and return it to the land. This is because the earth mother, Papatūānuku, birthed all living things and the land is her placenta or whenua. When we bury the whenua we return it to its place of birth. The Maori of New Zealand are Tangata Whenua, people of the land and so the word whenua means placenta, but also land. As man disappears from sight, the land remains. Burying a placenta can occur in many different ways. Some people weave, form or create an Ipu whenua, which is a vessel that is used to bury the placenta in. Others return the placenta straight into the earth. It is common to bury the placenta beneath a special tree or in a special place so that baby can be remembered through their connection to the earth. The iho or pito (different parts of the umbilical cord) can often be buried in a different place, traditionally it is placed in the hole of a tree trunk or a cliff face. The pito is the portion that is close to the baby and falls off after it has been tied. The iho is the central part and the rauru is the part that is closest to the placenta. Some tribes have customary places where all pito are buried at the corner of a boundary. It is important to bury the placenta deep and well wrapped in biodegradable materials, to protect the tree and prevent animals scavenging. Often a placenta is buried on tribal land so that the baby always have a home-place to return to. Many people consider storing their placenta in the freezer before burial; however this mixing of sacred pregnancy with our food is not considered appropriate in Māori culture. The Māori word whenua, also means land. All life is seen as being born from the womb of Papatūānuku, under the sea. The lands that appear above water are the whenua from her womb. They float, forming islands. For burial the placenta is placed in a specially prepared receptacle called an Ipu whenua and buried in a particular location. This practice reinforces the relationship between the newborn child and the land of their birth. The place where one’s umbilical cord was severed is called ‘te wāhi i kotia ai te pito’. This is a place of special importance for each person. It is their place of first emergence into the world, of first maturation and foundation. Placenta burial can be as simple or as ritualised as each family prefers. Traditionally a karakia of new life or ‘oho rangi’ was performed when the baby is separated from the whenua. Other traditions include a tohi ceremony which is a water blessing for the baby. People who are not from Māori culture may choose to bury their placenta and this can take any form that feels right to them. 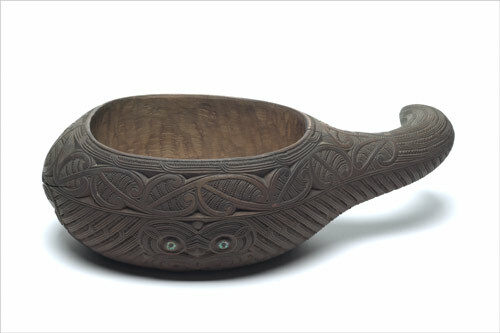 This replica ipu whenua was carved by Jacob Heberley of Te Āti Awa from tōtara wood. His ipu whenua features a band of kowhaiwhai (a scroll-like pattern usually found on the rafters of meeting houses) around the upper edge. The outer surface of the ipu whenua is embellished with the whakarare pattern. This distinctive pattern is made up of haehae (carved grooves) with elements that cross over at intervals. At each side of the ipu whenua is a typical Heberley-style koruru (face motif) and it has a deeply carved wheku (owl-like mask). The use of kowhaiwhai on vessels owned by chiefs and important people symbolised inherited mana (authority). Gourd vessels belonging to commoners were often left plain. Lotus birth is the process where the placenta is not cut from the baby, it is allowed to shrivel and fall away naturally, a process which can take from 3-10 days. This is considered to be a more natural and physiological process allowing the baby to be separated from the mother gently. There is also a physiological benefit of baby receiving their full quota of blood which is often denied them with hasty cord clamping. During a lotus birth the placenta is often salted and wrapped and carried with baby until it is ready to fall away naturally. Though there are many levels of lotus birth and a physiological 4th stage where the placenta is birthed naturally and not clamped for several hours is considered a lotus birth also. Many mammals will eat the placenta when they give birth, this is to protect the newborn from predators but also to provide essential nutrients to the mother. Nothing is wasted. In traditional Chinese medicine the placenta was cooked and dried and ground into a powder before being used to supplement the maternal diet. The hormones in the placenta and the nutrients are said to help prevent postpartum haemorrhage, post natal depression and to aid in milk supply. Despite a cultural squeamishness from the uninitiated, placentophagy is gaining popularity and it is now common to find people who will encapsulate your placenta for you after birth. “At the beginning of your world, I was part of you. of our father and mother’s being. became a pathway for the flushing currents of our mother’s blood. when you awoke I was your companion. you as nearly, as sweetly or as softly as I did. As our connection was severed you wept for me once, then were gone.